Have a Professional Handle Your Plumbing Problems | A Step Above Plumbing Inc. Have a Professional Handle Your Plumbing Problems | A Step Above Plumbing Inc. Plumbing problems that arise in your home can range from slight annoyances to full blown emergencies, but most of the time they fall somewhere in between. That’s why sometimes, it can be difficult to know when you need to hire a plumber and when you can handle the problem yourself. To add to that confusion, many homeowners take personal pride in their ability to maintain and repair their home themselves. This leads many people to attempt to fix plumbing problems on their own, even when the problems are serious and require special knowledge and training. Attempting to fix serious plumbing problems without the proper know-how can be dangerous and cause damage to your home. Even professional plumbers sometimes make mistakes, which is why all trustworthy plumbers are licensed and insured. That way, if something goes wrong that caused damage, it can be handled with no extra charge. Also, because of their training and experience, professional plumbers are far less likely to cause damage than the average would-be handyman. Plumbers are also trained on how to identify the source of a problem quickly, and they have specialized tools that make the job faster and easier. 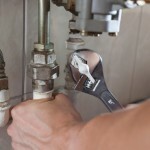 Trying to fix a plumbing problem yourself can be very frustrating and time consuming. It’s also possible that what appears to be the main problem to the untrained eye is actually just a symptom of a larger problem that’s not easily seen. In some cases, it may even be illegal to do the repair yourself. Professional plumbers understand municipal and state codes and will install or repair pipes and faucets to comply with them. A homeowner trying to solve a plumbing problem themselves may inadvertently break the law because of their lack of knowledge and incur penalties when the oversight is discovered.